LAMPEDUSA - The 49 migrants aboard the NGO Mediterranea Saving Humans rescue ship Mare Ionio have disembarked at the port of Lampedusa after docking there on the orders of the Guardia Finanza police. The ship entered the island’s port Tuesday evening after saving the migrants, including 12 minors, in waters off the coast of Libya on Monday. After the vessel was docked, migrants were heard shouting “Liberté, liberté.” One migrant suffering from pneumonia was immediately disembarked and taken to a medical facility. Interior Minister Matteo Salvini said Monday that the rescued migrants would not be allowed to enter Italy. Therefore, hearing that the ship has been docked at an Italian port, Salvini declared, “This is abetting illegal immigration,” adding that “Those who do wrong pay.” Salvini said Tuesday that he is seeking the arrest of those responsible for the Mare Ionio. Following what Salvini has described as an illegal intervention by the Mare Ionio, he has also gathered a group of experts and officials from Italy’s police forces to evaluate the situation regarding migrant arrivals after he the new directive he issued Monday. The directive stressed that Italy's coast is not the only place ships can head to after a rescue, highlighting that ports in Libya, Tunisia and Malta are often nearer. It also added that Italy is not obliged to assign a “place of safety” under international law if a vessel “deliberately and autonomously” heads towards the country. 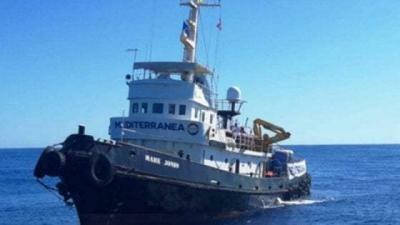 Alessandra Scìiurba, the spokesperson of Mediterranea responded that “Minister Salvini's directive does not have much value.” “As far as we are concerned, there are the rights of people, international law, human rights, international conventions,” she added. Libyan Navy Spokesperson Admiral Ayob Amr Ghasem confirmed Tuesday that the ship had “acted improperly,” as the Libyan coast guard was only contacted after the rescue. Deputy Premier Luigi Di Maio reaffirmed that the Mare Ionio acted against Libyan orders. “I have just spoken to Interior Minister Matteo Salvini. We are verifying the respect of legality. We have found several irregularities: the Italian NGO acted without listening to the orders of the Libyan Coast Guard, going against those orders,” said Di Maio.